About two months ago my friend Peter told me a story that immediately caught my interest. It goes like this. In mid April, Peter was travelling through Washington D.C.'s Reagan National Airport. While he was sitting waiting for his flight he heard "Hail to the Victors" from across the concourse. He got up, walked over and saw a group of Michigan alumni laughing and cheering as they boarded their flight. They were standing next to an older gentleman playing french horn. Peter wasn't really sure what was happening, but as the man said his goodbyes to the Michigan alumni he turned the page in his music binder and began to play "Deep in the Heart of Texas" for a man wearing a Longhorn shirt. He still wasn't sure what was happening, boarded his flight, flew back to Austin and called me when he landed. Having heard the story I had to figure out who this mystery man was. The man behind the fight songs is Andy Leighton. Andy is a retiree of the Metropolitan Washington Airports Authority (MWAA) human resources staff and now volunteers with Travelers Aid, a volunteer group that provides information and referral services at airports. They're the friendly people that help you get around the airport. Andy is the only "musician at large" on the team. Armed with this information I grabbed a flight and headed up to D.C. in search of Andy. I spent half the day on Monday June 19th searching the airport after flying in. No sign of Andy. I went from concourse to concourse, asked the help desk if anyone knew where I could find him, no luck. I left the airport and re-strategized for my return flight on Wednesday the 21st. My flight home wasn't until 5:45pm that night so I figured I'd give myself the whole day to explore the airport until I found him. Back to the airport I went. After walking Terminal C and B I finally made it to Terminal A to check on the Southwest gates. This also was the terminal that I would be flying out of, so it was my last shot. I entered the concourse and heard nothing. No french horn. No fight songs. I sat at the main circular bar area and began checking some emails having pretty much given up in my quest to find Andy. Then just over my laptop I saw an elderly gentlemen with a babershop quartet style wicker hat and blue shirt setting up a music stand. Could it be? Andy? Out came the french horn and within minutes a fight song, Hail to the Victors. Over the next 45 minutes I stood and videotaped Andy playing. I watched how he interacted with passengers and waved at little kids. He was constantly interrupted not by passengers, but by gate agents calling boarding announcements. Each time he would stop, wait until they finished and then continue exactly where he left off. While he emptied his slide of spit I walked over and told him who I was, explained collegemarching.com and then asked him why he was doing this? "My job is to calm people down or in some cases rev them up if I know their rival school's fight song," he told me. "Hearing a familiar song like a fight song can really help a nervous flyer relax." "I really just try to make people smile." Countless people came up to Andy to tell them they recognized this song or that song, how much they appreciated him playing, asked if he was in fact playing on a french horn to show off their knowledge of musical instruments and even made requests for their school's fight song. He took the time to chat with them all. Andy grew up in Syracuse, NY and attended Hartwick College in Oneonta, NY. He never had the opportunity to march in college because there was no football team. He played french horn through college, but put it down when he went to work. 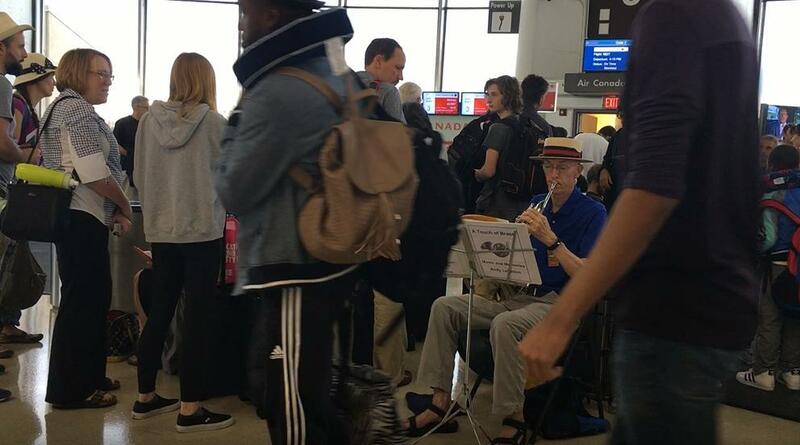 About 18 years ago he decided to play Christmas Carols during the holidays at the airport and it was a huge hit. He's been doing it ever since even after retiring in January 2016. During our conversation I noticed something about Andy that many passengers probably miss in their quick conversations. As we spoke it became clear that Andy's right hand maintains a tremor. While it has helped him develop a vibrato that would make even the best horn players jealous, it is actually a visible sign of Andy's biggest nemesis, Parkinson's. Andy was diagnosed six years ago with Parkinson's Disease, but he hasn't let it stop him from performing. "I like to think I have a bunch of good years left," he said defiantly. "Sometimes I can use my playing to have conversations with people about Parkinson's that are here in the airport and I enjoy that." Andy believes that staying active and healthy has helped to keep his Parkinson's at bay. 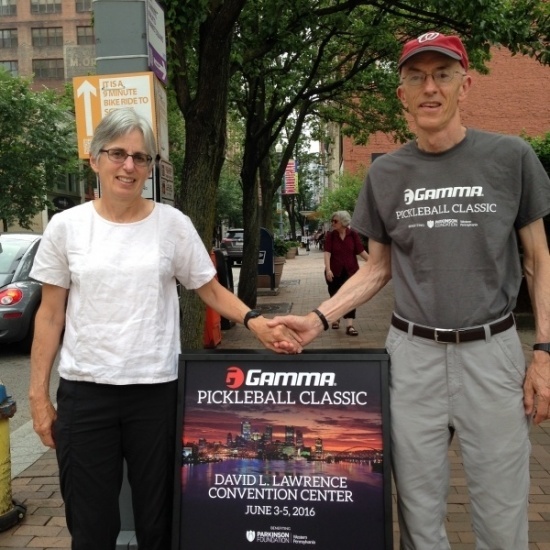 In fact this weekend Andy is off to Pittsburgh with his wife to compete in a pickleball tournament to help raise money for Parkinson's related charities, research and programs in the Pittsburgh area. His family, friends and fans have rallied together to support his efforts under the calling of "Andy's Army". 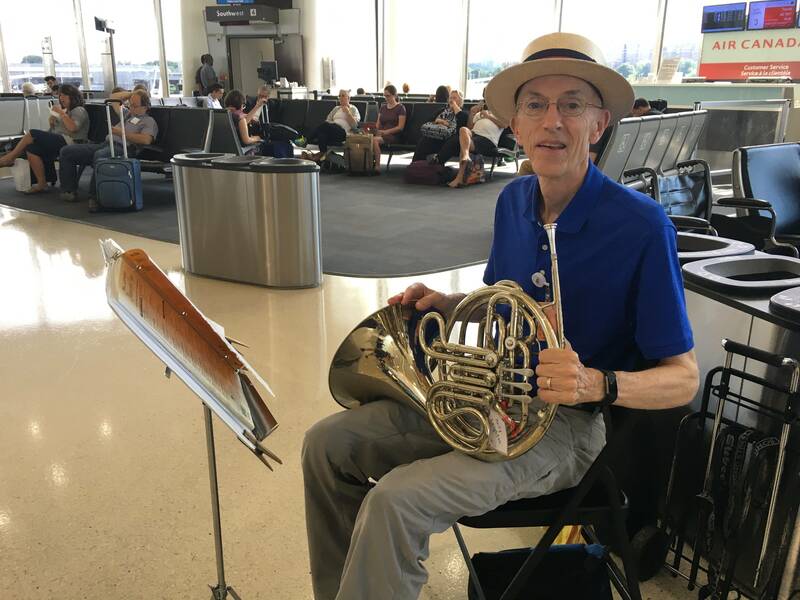 Beyond Parkinson's Andy has also helped military families and former soldiers feel welcomed in D.C. "I've played solo for the arrival of more than 300 Honor flights of veterans from WWII, Korea and Vietnam," Andy explained proudly. As we finished our conversation, Andy left me with one final thought; "I've got a lot more enthusiasm than talent, but people seem to enjoy the music so I'll keep doing it." And with that my boarding group was called for my flight and off I went back to Texas. As I sat on the flight it really hit me. There in Reagan National Airport was a man whose mission now at 69 years old was to try and make someone smile. Plain and simple. He wasn't doing it for money, wasn't doing it for fame, no. He was volunteering the precious time he has left on this earth as he battles Parkinson's to try and make other people smile. Join me in supporting Andy and make a donation today to Andy's Army right HERE. $10 is the minimum donation and Andy will personally message you if you do it. Learn more about Parkinson's and how you can help support your local chapters that are supporting those impacted by it HERE!